Kathy K. writes: Looking for information on a souvenir piece from Pan-American Exposition, Buffalo, New York. The date appears to be April 1901. It has 1901 Indian head penny inserted into one side with “GOOD LUCK SOUVENIR” above and “BUFFALO NY PAN AMERICAN EXPOSITION” below. The penny is on top of a four leaf clover. 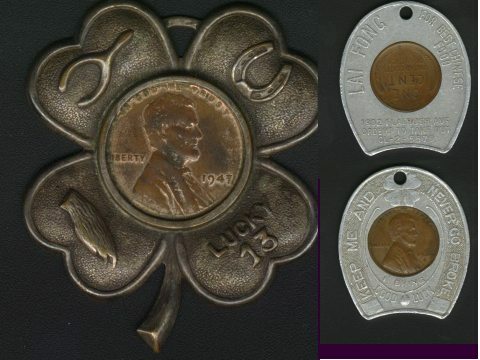 On the other side the back of the penny can be seen and above it says “LUCKY PENNY”, on the bottom it says “POCKET PIECE”. The penny is two horseshoes wrapped around it and “I’M” is on left and “IT” is on right of penny. It also appears to say “PAT APR 23 1901” on one leg of horseshoe. “Encased” coins are coins that have been inserted into a holder that changes the character of the coin from money to an advertising or souvenir device. The concept was really popularized at the Pan American Exposition in 1901 and was used extensively throughout the the 20th century for advertising. You have a neat encased cent! Estimated value in undamaged condition: $50 -$75 (see below for other examples of encased cents).